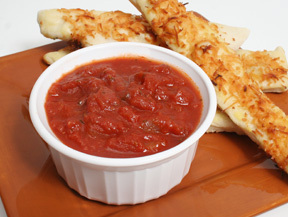 Use this restaurant recipe for Marinara Sauce as a pasta sauce (no meat pasta), as a soup base, on pizza or as a dip for cheese sticks. It’s delicious and easy to make. 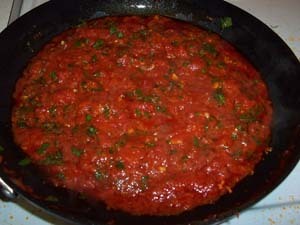 This is an easy but delicious restaurant recipe for this red sauce. And this restaurant sauce recipe can be used in many different ways and with a large variety of foods. Do not use aluminum pans unless they are hard anodized aluminum. This and other recipes that contain tomatoes will react with aluminum (or is it the other way around?) and cause an off taste. Also this sauce scorches easily so PLEASE keep it to a simmer. Simmer means to cook gently over low heat (no lid). You should only see tiny bubbles just breaking the surface of the liquid. Use immediately or refrigerate in shallow pan to cool safely. When the sauce is cool, transfer to a covered container. This sauce freezes well once it is cool. Thanks for finding the website. Please return often as more information and restaurant recipes are added regularly. 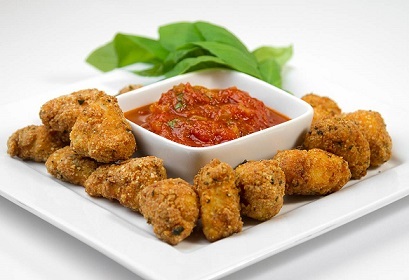 Enjoy your Marinara Sauce and the company of those you share it with!